The coming thing, or is it, and not for all. Small narrow gauge layout inspired by Giles Barnebe's plans on page 202. 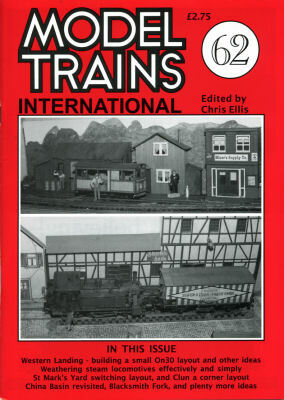 Author finally builds a layout to utilise his collection of On30 stock. Improving the look of model locomotives. Continued from 61/179 this part deals switching zones, the rail customers within and the cars that serve them, with the manner of operation. Compact automatic LMS/GWR layout using 10 inch curves. Unloading American covered hoppers by means of a trackside auger. Reworking of plans first shown in Issue 54. 1950's US switching layout designed as a challenging, but plausible operation.